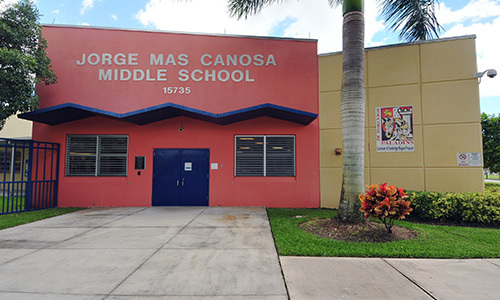 Welcome to Jorge Mas Canosa Middle School. I am proud to be part of the founding team for this state-of-the-art campus. Our school opened its doors in August 2007 for students in grade 6 and 7. We now have over 1,940 sixth through eighth graders. We are working diligently to offer students the best education while promoting global literacy through the study of languages. Students at Jorge Mas Canosa Middle School are exposed to highly trained, energetic teachers and will always be challenged, nurtured, and inspired. Our curriculum is rigorous and structured so that every child will be prepared to succeed in high school. Our dual-language program prepares our students to compete in the global workforce. We are a Cambridge International Center school and offer the University of Cambridge International Examinations Checkpoint program for Mathematics, Science and English to select students. We encourage community and parental participation. Please visit our web page for important information. If you are interested in becoming a volunteer please visit our school or contact us at 305-252-5900.